At Balanced life, we have time slots available by appointment only, Monday through Saturday.When booking your appointment, we will require your full name, e-mail address and phone number that are best to reach you at for those “just in case” moments! We will also ask for your credit card information to pay a non-refundable 50% deposit on your service or on an item being ordered in for you. Please have your credit card information ready so we can better assist you. If booking/ordering in-person, you will be asked to pay there. We recommend coming in 5-10 minuets early to get settled in (especially if it’s winter! ), ask any last minute questions and sign any paperwork. If you arrive late, due to high volumes of some of our services, we will be unable to extend your reservation time. You can book appointments online now! If your e-mail is on file, we will send you a reminder the day before to remind you of your appointment. 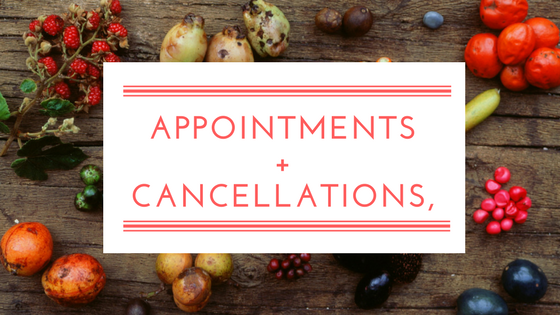 Please note that cancellations or no-shows do leave the aesthetician with an empty slot and no one to work their magic on! We require 24-48 hours notice of cancellations on treatments to avoid being fully charged for your scheduled treatment(s). If you need to reschedule, we require between 24-48 hours notice that it will be rescheduled even if you don’t have the date yet. Some of our machines are being booked 3 months in advance due to popularity, so to ensure all time slots are filled for those who want treatment in a fair manner, we require enough notice to be fair for both clients and aestheticians. Ordering a product we carry also requires a 50% deposit at time of order. If we order in a product for you, we will give you a call when it comes in. You will have 6 months to pick up the order from the day we call. If the item is not picked up within 6 months of our call, it will then remain in our possession for our use. If for some reason the product cannot be picked up, please call us and we will find a way to get it to you!